Is God like Jesus, or is Jesus like God? People not believing in Santa Claus (the riddle of Santa). Not believe in Santa Claus . . . nobody sees Santa Claus, but that is no sign that there is no Santa Claus. Generosity and love are the most real things in the world, yet neither children or adults can see them! Squeaknibble was a mouse who didn't believe in anything she hadn't seen, and she'd never seen a Cat. 'You're just trying to scare me," she told her parents. 'There are no cats." Christmas Eve, Squeaknibble's mother put her to bed early so that Santa Claus could leave his presents while she was asleep. After the lights were out, Squeaknibble thought, “'I don't believe there is a Santa Claus. I've never seen him." She left her bed and the safety of the family mouse hole to turn cartwheels on the living room rug. Suddenly, a large shadowy figure loomed like a monster ghost all covered in white fur. The creature purred, "Don't be afraid, little mousie, it's only me, Santa Claus, come to bring you a present of delicious cheese." "Oh," said Squeaknible, "how nice." Christmas came and Christmas went, and little Squeaknibble was never seen again. 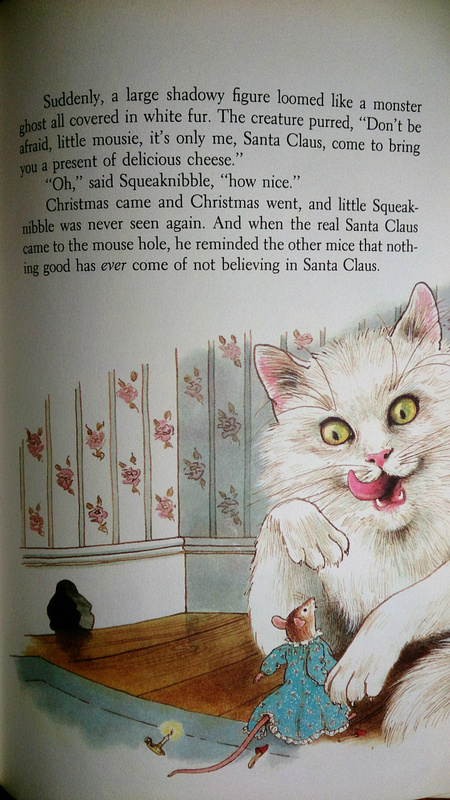 And when the real Santa Claus came to the mouse hole, he reminded the other mice that nothing good has ever come of not believing in Santa Claus. From One Minute Christmas Stories adapted by Shari Lewis and iIllustrated by Jan Palmer.